A must-make Greek pasta salad recipe featuring bowtie noodles, cucumbers, tomatoes, Kalamata olives and Feta cheese! The perfect make-ahead potluck recipe or light lunch idea! 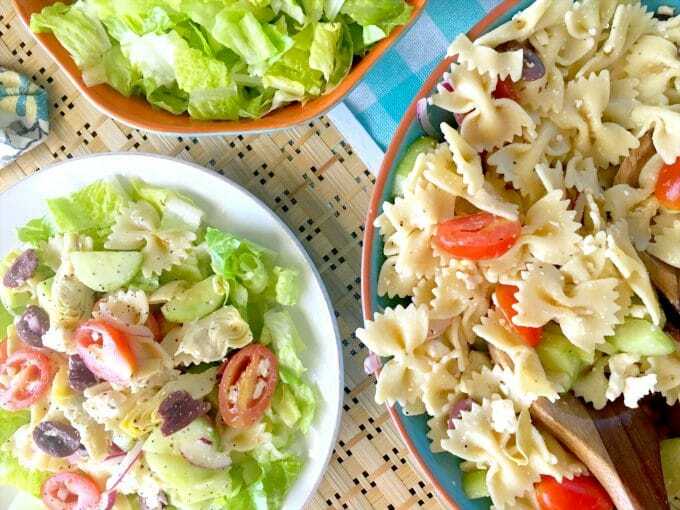 This Greek pasta salad recipe is perfect for a quick lunch or a light dinner. It features all of the components of a traditional Greek salad: Brine-y Kalamata olives, sharp Feta cheese, crisp, cool cucumbers, sweet grape tomatoes and juicy, marinated artichoke hearts…only it’s waaaaay better because there’s pasta involved, and the lettuce, my friends, is optional. Of course, I’m somewhat joking. I love a good leafy green salad just as much as the next gal, but we are talking pasta here folks. So here’s the beauty of it — you really don’t even have to choose! 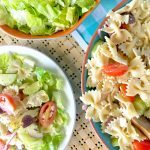 This Greek pasta salad is incredible with or without the Romaine, and to keep things interesting, I enjoy it both ways all throughout the week. It keeps well and seems to get better day by day. Isn’t pasta a miraculous thing? I’ll make a big batch at the start of the week and pull from it each morning/afternoon for a quick, make-ahead lunch. Greek pasta salad also makes for a refreshing addition to any barbecue on a hot summer’s day, or potluck treat to any brunch or luncheon. Cause, c’mon — who doesn’t love Greek salad?…and pasta? Only the crazies. That’s who. Please, enjoy. 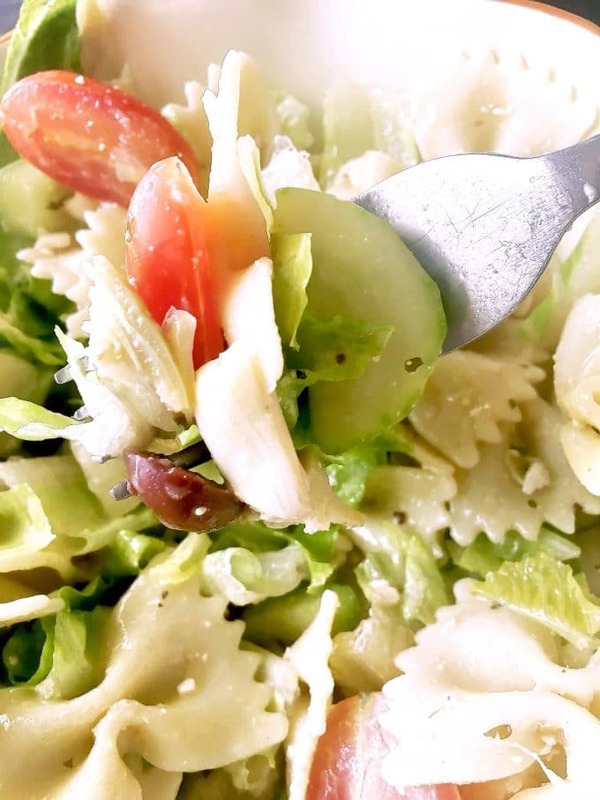 Greek pasta salad featuring bowtie noodles, cucumbers, tomatoes, Kalamata olives and Feta cheese! Bring a large salted pot of water to a roaring boil. Add Farfalle and stir for 1 minute. Cook to al dente according to package instructions and transfer to a strainer. Allow cold water to run over the cooked noodles until they are lukewarm. Drain thoroughly. 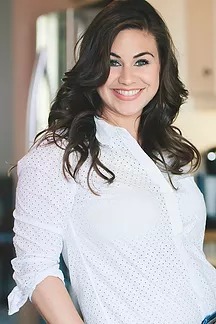 Transfer to a large mixing bowl and toss with ¼ c of Italian dressing and sprinkle with kosher salt and pepper. Add the remaining ingredients to the bowl with the pasta, along with the remaining ½ of dressing. Toss gently to evenly combine and season once more to taste with Kosher salt and black pepper. Refrigerate and serve cold on its own or atop a bed of Romaine lettuce.